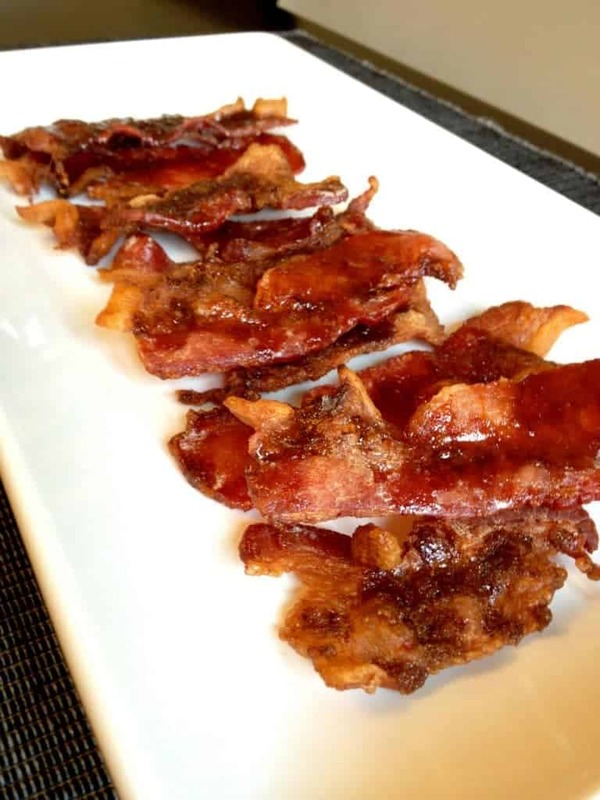 This sweet and spicy oven cooked bacon is so addicting!! Seriously, it’s usually gone in minutes. MINUTES. And, cooking bacon in the oven is genius. GENIUS. The bacon cooks better and there’s less mess to clean up! Hello Guys. Susie again with a cooking tutorial. I am one of the few people I know not crazy about bacon. Don’t get me wrong, I love the stuff if it is cooked correctly, but so often it isn’t. Cooked correctly for me is crispy throughout without being tough…thin, not thick…not any of those slimy parts. Mix together the brown sugar, cayenne pepper and black pepper, set aside. Getting ready: Cover a rimmed cookie sheet with aluminum foil – cleaning up is much more fun this way. Spray cooling rack with cooking spray – for the same reason as above and set the rack on the cookie sheet. 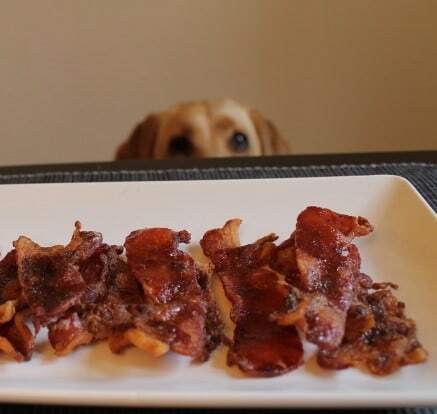 Ok, now you are ready to place the bacon on the rack. Drape the bacon across the cooling rack with a little space between strips. If you need to cut some of the bacon in half to fill in the spaces, that is fine. Place the bacon on your oven’s middle rack and turn the oven to 375 degrees. Bake for 20 minutes. 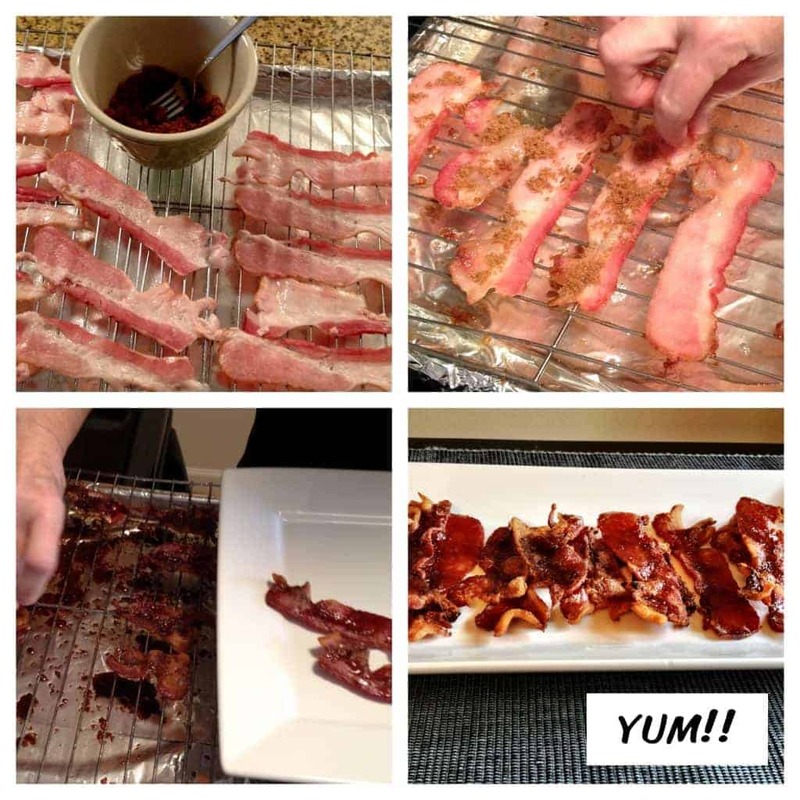 Take out the bacon, flip each slice over and sprinkle with the brown sugar mixture on each slice of bacon. Bake for 15-20 minutes more. Watch closely for the last 5 minutes – it can burn quickly. This looks delicious! I love all your recipes. I will be trying them for sure! Keep the posts coming. thanks tish!!! i miss you! i have got to meet ms violet sometime!